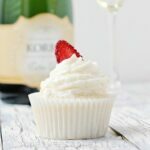 Celebrate every occasion with these homemade Champagne Cupcakes! Packed with the bold flavor of champagne and a sweet strawberry filling giving you the perfect cupcake recipe! Shout out to all of my champagne loving friends. This recipe is for YOU. All of the magic starts with a light champagne sponge cake. From there you fill it with a sweet strawberry sauce. Top everything off with the most AMAZING champagne buttercream. Want to get all sorts of fancy? You can even add a candied strawberry right on top. While these taste great individually, all three components combined are what make the magic happen. Let’s dive into some basics so you can really get the best cupcakes! How do you make homemade cupcakes? Follow the tips below for perfect homemade cupcakes every time. Use the best ingredients available. Using quality ingredients makes all of the difference. For example, pure vanilla extract adds a much bolder, and better, flavor than imitation extract. Make sure your ingredients are room temperature. This will help everything blend together and incorporate nicely. Mix slowly. Making sure the ingredients are just incorporated is key. Over mixing can give you a dense cake. Use a scoop for even cupcake sizes. I like this one. Remove from the cupcake pan immediately. The cupcakes will continue cooking if you leave them in the pan while they cool. This can produce a dry cake. I decided to fill my cupcakes with a simple strawberry sauce. I added a bit of champagne to the sauce but it really was not necessary. That sauce is delicious all on its own (try it on top of my cinnamon or chocolate waffles. You will not be disappointed). Use a sharp pairing knife or large piping tip to cut out the center of your cupcake. Fill with 1-2 tablespoons of your favorite filling. Place the removed piece of cake back on top. Frost with your favorite frosting or buttercream. The strawberry filling really adds a punch of fruity flavor to the soft and spongy cake. Don’t skip this part. It also helps to break up the champagne flavor and adds a nice sweetness to the center. And finally, I topped the cakes with a champagne buttercream! So easy to make it will make your head spin. Pipe it on and you are ready to PAR-TAY! Mix together with the powdered sugar in the bowl of an electric mixer. Slowly add a bit of champagne. Turn the mixer to high and whisk until the desired consistency is reached. I am not kidding when I say they are champagne flavor packed. You can taste it from the cake to the frosting. Preheat your oven to 350 degrees. Line two muffin tins with paper liners. In a small bowl combine the flour, baking powder, and salt. Whisk the egg whites until peaks form and set aside. Cream together the butter and sugar. Add the vanilla followed by the dry ingredients and champagne. Fold in the egg whites. Divide the dough between your paper liners. Bake for 15-18 minutes, or until a toothpick comes out clean. Whisk the butter with an electric mixer until light and fluffy. Slowly add the powdered sugar followed by the champagne. Whisk until fluffy. Wow, these are so pretty and VERY romantic! It’s crazy to already be thinking of Valentine’s Day.. but it’s just around the corner I suppose! Pinning! These look fabulous, I love the strawberry surprise in the middle. Your photos are very nice too! Coming from Tater Tots and Jello! I have a low-key bachelorette party to plan soon, and I think these cupcakes might be the ticket! Thanks! Does this frosting pipe well? I wanted to make ruffles with it. Also how many cupcakes does this recipe make? Thank you! Cant wait to try them…. OOOH and do you think the strawberry sauce would mix well with lemonade to make strawberry lemonade? It piped well for me. I think it all depends on how much powdered sugar you add in. And it makes an amazing strawberry lemonade! Do you have to use a certain champagne, or would any kind work? I’d keep it to a dry champagne if you can, but any will work in a pinch. Best recipe for a white cake. 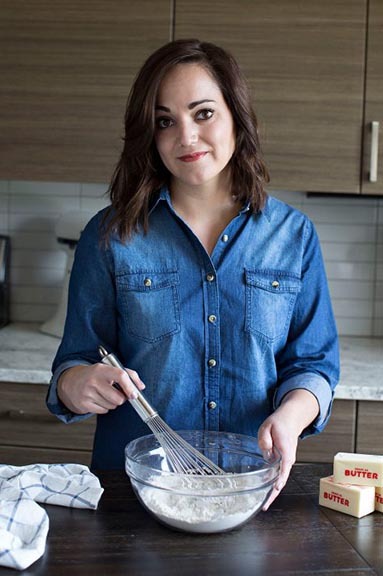 My husband is a big fan and I couldn’t never be happy with a recipe until now. He’s raving about it. Thank you for sharing. i made a half a batch of cupcakes today for a test. I thought they were heavy feeling. Not bade tasting. I did use peach champane. What do you think. Also spongy which I think might be right. So I was so excited about these and especially the icing. Just spent the last two hours trying to fix the champagne icing to no avail. After research I noticed the amount of buttered called for is listed wrong at 1 cup softened. It should be 1/3 cup and now I have no icing, no time, and because it’s Christmas eve no way to fix these in time for christmas. Super dissapointed. If you want to email me at [email protected] I would be happy to troubleshoot with you. I’ve made these cupcakes several times since posting and haven’t had a problem. I made these for a shower and used a whole strawberry instead of the sauce and they were amazing!!!! Everyone raved about them for months!! Do you think that it is possible to get the same great taste in a cake and do you think that I could spread the strawberry sauce across the layers? Awesome Webpage, Preserve the fantastic work. With thanks!. It says strawberry sauce but I don’t see the recipe for it? Did u just buy it?